The Goolsky Q353 is a cool quadcopter that comes in a stylish and unique design. Most of the mini drones in the market can only be flown in the air. 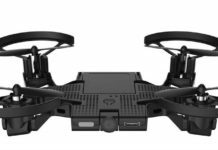 However, the Goolsky Q353 Triphibian quadcopter is a three-in-one RC vehicle that is designed for flying, sailing and running. Pretty cool, huh? You will also be glad that it is the cheapest waterproof drone. It is made to sail in water. 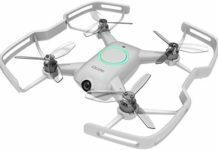 The Goolsky Q353 drone was designed to take your outdoor adventure to a higher level. The three different functionalities will simply blow your mind. It is waterproof meaning that even if you submerge it or it flips over in the water, its motor will not be damaged. Besides, it will roll itself up easily to stay upright in the water. Apart from being able to fly, run and sail, it is also rich with other features that ensures an enjoyable experience with it. 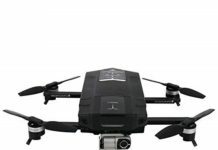 You may be tempted to ask about the price, seeing as this is a unique drone that can fly, run and even sail in water. It is very affordable, way below the $100 range. Would you believe that? Well, it is true. But apart from the price, run, fly or sail, are there other things worth writing home about this drone? Goolsky Q353 Triphibian quadcopter comes in a unique and good-looking design. At the first glace at its body frame, you can almost mistake it for a toy boat. 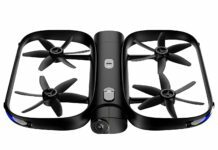 The unique design is meant to support air, water and ground modes, which makes it an extremely versatile drone. 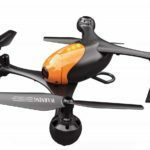 Due to its functionality, this drone features a robust and durable construction. This enables it to handle its various functions without any hitches. It is 100% waterproof and it comes in a nice blend of orange and black colors. The bright orange color helps it to me more visible while in the air or in the water. This drone comes fully assembled; it is ready to fly right from the box. It measures 36.5cm by 36.5cm and it has a total weight of 323g only. Courtesy of the lightweight design, the drone is ideal for traveling, allowing you to explore different outdoor setups. 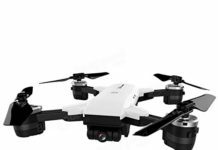 Apart from the quadcopter itself, the package includes all the other accessories that you require to fly, drive, or boat your drone. 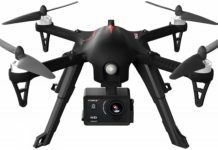 They include four spare propellers, 2.4G Remote Control (batteries purchased separately), charger set and adapter, and a detailed user manual. 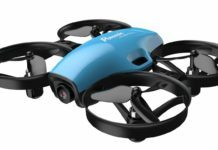 Flying this drone at night or in low light conditions is easy. It is fitted with an LED flashlight under each propeller, which makes it easily visible in such conditions. The LEDs also alerts you when it is time to fly your drone home for a recharge. They begin to flash when the battery is running out of juice. This drone is powered by an inbuilt 7.4V 1200mAh Lithium Polymer battery. This battery provides you with about 6-7 minutes of working time and it takes about two hours to be fully charged. The quadcopter does not have a camera, hence there is no need of a mobile app. This quadcopter is operated by a 2.4 Ghz remote control that controls the drone within a distance range of 150 meters. The remote transmission system has four channels that are designed for anti-interference purposes. It also has a convenient LCD screen that displays all the necessary information about the drone’s activities. A number of buttons and two joysticks enable you execute different functions. This drone uses a 6-axis gyro system, which ensures that it remains stable while on flight. This drone is quite easy to fly, especially when you have selected the right mode. As earlier noted, this drone features three modes; land, water and air. Selecting the right mode on the remote control will enable you to control your drone properly. The land mode prompts your drone to drive on the ground using its wheels. Since the wheels are tiny, the drone tends to be a bit shaky. Therefore, always ensure that you drive it on even ground, as opposed to a bumpy or rocky one. When on the air mode, the drone flies smoothly in the air and it is very stable and easy to control. It is also a relief for the beginners to know that they can control the speed, which makes controlling much easier. Headless mode makes operating the drone quite easy for amateurs as it can fly in any direction. This mode aligns the drone’s movements to that of the controller, making it easier to control the drone regardless of the direction it is facing. The one key return feature enables the drone to fly back to the exact position from where it took off. The water mode on the other hand allows you to sail your drone on water just like an amphibian car. It is absolutely waterproof and it comes with a water recovery mechanism. This means that even if you damp it in the water, it will float right back up. In addition, even if you land it upside down in the water it will recover and flip over to the right position. If it also happens to flip upside down, it will roll itself way up with much ease. Who Should Buy the Goolsky Q353? 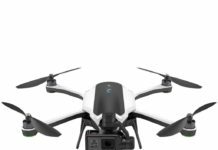 The Goolsky Q353 is a perfect purchase for any drone enthusiast who would love to experience much more than just fly their drone in the air. 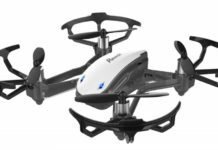 It is also a great choice for any outdoor lover who would want a drone that is different from the drones we are used to. This quadcopter will most definitely attract some attention and make heads turn in the park. It is ideal for drone lover of all skill levels from the beginners to the intermediates and even the pros. Although it may not be too ideal for younger kids, teenagers will absolutely love it because it is fun and easy to operate. Note that you can only use this drone for fun since it does not have a camera. As you have seen from this review, the Goolsky Q353 is a unique drone that goes above the norm. It is extremely fun and exciting to fly and its design supports air, land and water operation. The beauty about it is that you only have to part with a relatively small amount of cash to own this amazing drone. Again, it is user-friendly; even if you are a newbie, you will master all the controls within no time and become a pro pilot. You can own the cheapest waterproof drone without denting your wallet.